A lot of my clients who get great results from their AdWords PPC campaigns ask me how they can increase AdWords traffic and get more of these quality clicks. This is a great question to get, however the solution to getting the same high quality traffic may not be as simple as simply turning up the dials. As you make changes to your campaigns, especially if you add new products and services, your results might change as well, and the ROI you were previously getting might start to look very different with a new, more broad set of keywords for example. There are many ways and strategies to boost clicks and traffic, but this blog post will focus on 4 quick tips that help ensure that the profitable campaigns you are running already are showing as much as possible. Check if your profitable campaigns are restricted by budget. Review lost impression share data and see if you are losing impressions due to limited funds. 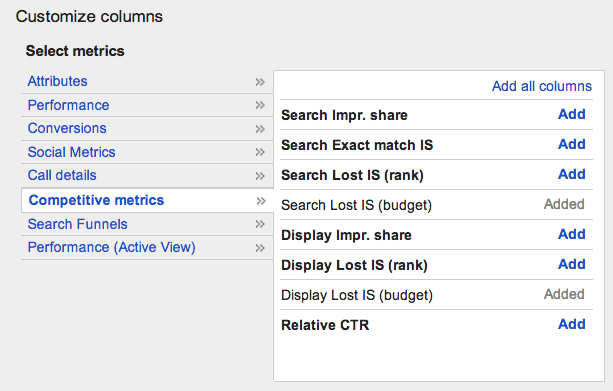 Customize your data columns in your AdWords campaign management page to see Search Lost IS (budget) and Display Lost IS (budget) metrics in your reports. Sort by one of those metrics to see campaigns that are losing impression share due to limited budget and consider increasing your budgets. Review your daily spend for the past couple of weeks and see if you are coming close to reaching your max budget each day. If that’s the case, even if you make no other changes to your campaigns, increasing the budget can help you bring more of the same quality clicks and conversions. The default ad delivery method when you create a campaign is “Standard” which means that Google will distribute when your ads are showing throughout the day in order to not go over your budget. This also means that your ads may not show every time a user is searching. Change the delivery method in your campaign settings page to “Accelerated” to make sure your ads show as soon as possible. Check your location and language targets and consider broadening them. For example, if you are currently only targeting English speakers in the United States, you might want to consider targeting the Spanish language as well. Raise bids on ad groups that are losing impressions share due to low ad rank. Focus on ad groups and keywords that are converting within your targets already. This will help you get a better ad rank, more competitive ad position, and more clicks. This entry was posted in Google AdWords and tagged increase adwords traffic, increase traffic on May 5, 2014 by kristina.